Summer or winter, morning or evening, sun or rain… Rozenhoedkaai has the enthralling ability to always make a stunning impression. It should come as no surprise that this continuous to be one the most photographed spots in Bruges. 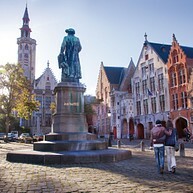 Here anyone can create his or her picture perfect postcard of Bruges. Rozenhoedkaai’s sophisticated class makes it the ideal location to pause for a moment and together with your loved one enjoy one of Bruges’ most timeless sceneries. In the south part of Bruges, surrounded by trees and the adjacent Minnewaterpark, you’ll find a small rectangular lake called 'Minnewater' or Lake of Love. The tragic romance of Minna and her warrior love Stromberg has evolved into local legend saying that you will experience eternal love if you walk over the lake bridge with your partner. This of course turns Lake of Love into an exceptionally romantic spot. Enjoy the scenery from the lake bridge, one of the benches along the lake or stroll through the calm Minnewaterpark. The century old Princely Beguinage Ten Wijngaarde with its whitewashed facades and tranquil convent garden leaves no one unaffected. While the entrance gates are open seize the opportunity to discover all facets of this peaceful haven. Admire the leaning trees and visit the small beguinage museum and tiny church. Keep your eyes open for perhaps you will encounter one of the nuns of the Order of St. Benedict, the present inhabitants of the beguinage. 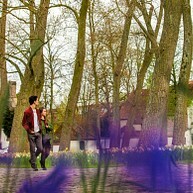 Should you find yourself in Bruges in springtime you certainly mustn’t forget the beguinage! At this time of year blooming daffodils grant the beguinage refined warmth. 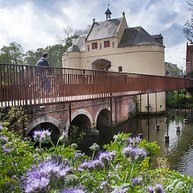 The charismatic area of Bonifacius Bridge and Arentshof has the ability to enchant many a visitor. Its irresistible combination of striking history and warm romance may take your breath away. Arentshof, located along one of the picturesque canals, manages to create an entirely unique atmosphere with its tall trees, hidden benches, mysterious pieces of art and marvellous view on Church of Our Lady and Gruuthuse palace. It’s one of those places to watch the world go by: tourist boats pass and people wander around while the clatter of hoofs from the horse drawn carriages echoes throughout the day. Don’t be fooled further ahead, for the charmed ancient looking Bonifacius Bridge dates from early 20th century and is one of Bruges’ youngest bridges. While you admire the fairytale like canals with inclined houses and passing tourist boats a humble feeling will no doubt wash over you when looking up at the Church of Our Lady. In the evening carefully chosen illumination further enthralls this cherished lovespot. No doubt the beautiful courtyard of the Gruuthuse palace, bordering on the canals, has a high wow-factor. The impressive 15th century city palace amazes with its medieval opulence and its splendor illuminates the entire courtyard. In the shadow of the Church of Our Lady you’ll find yourself enveloped by riches and wealth from times past. Wander around, discover surprising corners of the courtyard or give your feet a break by enjoying the scenery from one of the benches. Bruges’ convenient compact size allows you to carelessly get lost and saunter hand in hand along one of the many lovely canals. 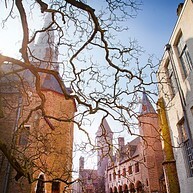 The possibilities are truly endless, but Groenerei has to be one of the most beautiful locations belonging to Bruges. 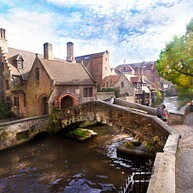 It offers a varied yet typical Bruges scenery with old bridges and historical buildings framed by a touch of nature. No matter where you go in Bruges you will no doubt fall in love with the cities arteries and afterwards fondly remember those walks along the canals. The Queen Astrid Park is a classic just-around-the-corner-get-away-from-the-crowd place. Located right inside the city, near some of the most visited places of Bruges and yet quiet and calm. Surrounding trees and bushes make it a somewhat secluded park. The tiny lake and colourful kiosk are an ideal place to relax with your loved one. As far as size goes Huidenvettersplein (Tanners Square) cannot compete with the Market and Burg, but the tiny square which is enclosed by restaurants is pleasantly adorned by the presence of artists. Thus there is no escaping the cozy and intimate atmosphere which surrounds the square. Let your creative mind admire the paintings, but also think of your feet and stomach by pausing at one of the many restaurants. Standing in the middle of the square the renowned Bruges painter Jan van Eyck (1370 – 1441) proudly overlooks the domain that wears his name. Still, he has to share the limelight with the square’s alluring style for once this was the old harbour of Bruges where ships loaded and unloaded. Even though fierce traders and rich 'poorters' (citizens with city rights) no longer populate the square, it still holds a captivating appeal. While you’re discovering Jan van Eyck square, the little bear of Bruges approvingly looks over your shoulder. Stroll around, admire the pretty facades of the Old Tollhouse, Pijndershuis and Burgher’s Lodge or simply take pleasure in a short break along the canal. Jan van Eyck square is furthermore an ideal gateway to explore the tranquil St. Giles' quarter with its working-class neighbourhoods. While the picturesque town center is endlessly fascinating we mustn’t forget Bruges’ city ramparts. The green lung encircles almost the entire town and offers a variety of interesting locations worth discovering. You can for example admire the four remaining windmills as well as several medieval town gates. The modern Conzett Bridge spans the entrance to the small marina and is just one of many bridges that frequently open for boats. The ramparts between the train station and Ezelpoort city gate allow you to leisurely stroll and enjoy nature. A tour along the ramparts is an ideal opportunity to process all your Bruges impressions.